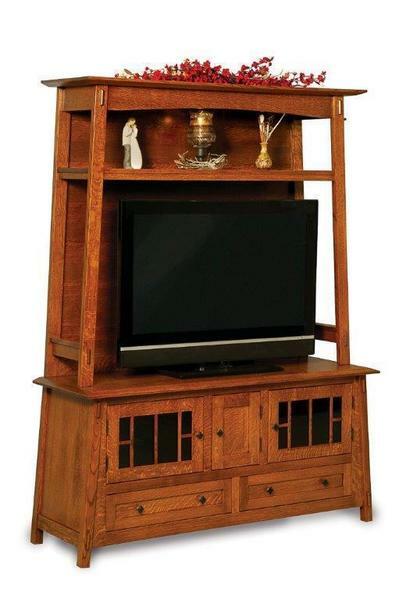 The living room is the beating heart of the home, and our Amish Colbran Entertainment Center is the ideal way to bring beauty and balance to this most important room. With a slightly tapered shape, strong lines, and beautiful details, this stand makes the ideal focal point for family spaces. The wide central space provides a secure place for a television, while the shelf above adds a prominent space for displaying precious memories and decor. Down below, the open shelves offer ample space for media consoles of all kinds, while the beautiful shelves beneath add room for stowing DVDs, CDs, games, and more. Taken as a whole, the Colbran really is something special! Every element of this piece is handcrafted from your choice of solid hardwood by expert Amish craftsmen right here in the USA, promising you nothing but the best in home-grown quality and attention to detail. If you've any questions at all about this piece, please don't hesitate to get in touch - we would love to hear from you!